Apple has started to ban VPN applications from its iOS store in China. According to the company, these apps include content that's illegal in the country, thereby violating Apple's policies. Needless to say, VPN providers and users are not happy with the privacy-obstructing censorship efforts. 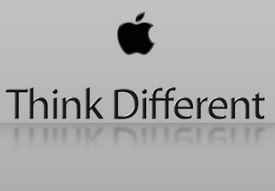 Apple is known to have a rigorous app-review policy. Over the past several years, dozens of apps have been rejected from the App Store because they mention the word BitTorrent, for example. The mere association with piracy is good enough to warrant a ban. This policy is now expanding to the privacy-sphere as well, at least in China. It is no secret that the Chinese Government is preventing users from accessing certain sites and services. The so-called ‘Great Firewall’ works reasonably well, but can be circumvented through VPN services and other encryption tools. These tools are a thorn in the side of Chinese authorities, which are now receiving help from Apple to limit their availability. 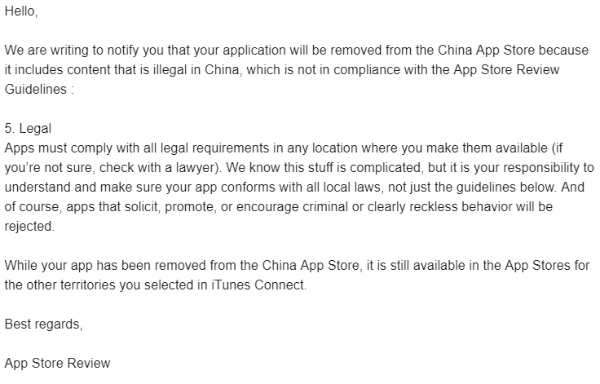 Over the past few hours, Apple has removed many of the most-used VPN applications from the Chinese app store. In a short email, VPN providers are informed that VPN applications are considered illegal in China. VPN providers and users are complaining bitterly about the rigorous action. However, it doesn’t come as a complete surprise. Over the past few months there have been various signals that the Chinese Government would crack down on non-authorized VPN providers. In January, a notice published by China’s Ministry of Industry and Information Technology said that the government had launched a 14-month campaign to crack down on local ‘unauthorized’ Internet platforms. This essentially means that all VPN services have to be pre-approved by the Government if they want to operate there. Earlier this month Bloomberg broke the news that China’s Government had ordered telecommunications carriers to block individuals’ access to VPNs. The Chinese Government denied that this was the case, but it’s clear that these services remain a high-profile target. Thanks to Apple, China’s Government no longer has to worry about iOS users having easy access to the most popular VPN applications. Those users who search the local app store for “VPN” still see plenty of results, but, ironically, many of these applications are fake.